The purpose of this article is to show you how to calculate when your Saturn return will take place. It assumes little to no prior knowledge of astrology, and only employs tools that are freely available online. For tips on how to interpret the Saturn return once you have calculated when it will happen, please see my previous article titled Five Tips for Interpreting the Saturn Return. I also made a video which covers some of the main points in this post, so if you would like to watch that first then just skip to the end of this article. If you have any questions, please feel free to post them in the comments section below. First let’s define our topic. What is the Saturn return? The Saturn return is a period of time in a person’s life when the planet Saturn returns to the location that it was in when they were born. 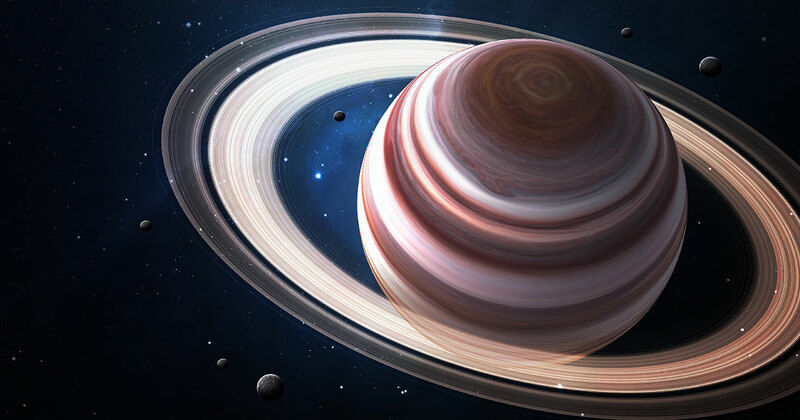 Saturn has about a 29 year cycle, so the first Saturn return takes place around the ages of 27-31. There is also a second Saturn return around the ages of 57-61, although typically the first Saturn return is seen as being the most significant. In order to calculate when your Saturn return will occur, you first need to determine exactly where Saturn was in the sky at the moment that you were born. In order to calculate where Saturn was when you were born, you need to get a copy of your “birth chart”. I would recommend that you go to www.astro.com and then enter your birth information on their free birth chart calculation page. If possible, make sure that you include the correct birth time and location, preferably from your birth certificate, since for some people this can make a big difference. Once you have a copy of your birth chart, over on the left side of it you will find a box which lists all of the planets and tells you what signs they were in when you were born. In the example to the right Saturn is listed as being at “17 Sco”, which means that when this person was born Saturn was at 17 degrees of Scorpio. There are only 30 degrees in each sign of the zodiac, so the number listed will always be somewhere between 1 and 30, and then it will list the name of the sign your Saturn is in. Pretty simple, right? You will also notice that there is a little symbol next to each of the planets. These are known as planetary “glyphs”, and they are important because they are often used as shorthand to designate the positions of the planets in astrological charts. The symbol for Saturn is particularly important for our purposes, so you should make sure that you memorize what it looks like. If you need some help figuring out how to draw it then check out my tutorial on how to draw the astrological glyphs. Now that you know where Saturn was when you were born, and you know what the symbol for Saturn looks like, the next step is to figure out when Saturn will “return” back to the same spot in the sky as when you were born. This involves two separate but related measurements: first, the return to the same sign of the zodiac, and second, the return to the exact same degree. 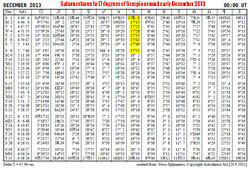 Let’s start by determining when Saturn will return back to the sign of the zodiac that it was in when you were born. 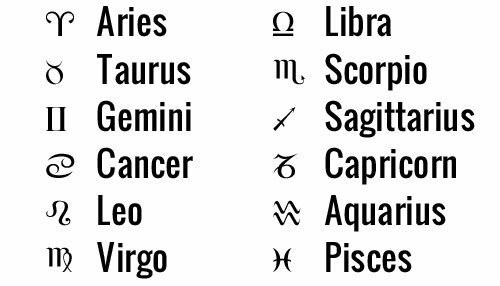 Just as the Sun was in one of the twelve signs of the zodiac when you were born, which is what designates a person’s “Sun sign” or “sign” for short, each person also has a “Saturn sign”, which is probably different from their Sun sign. In the previous step I showed you how to obtain a copy of your birth chart, and how to locate Saturn in it by identifying the glyph or symbol for Saturn. You also should have identified which sign of the zodiac that Saturn was in at that point as well, as the first three letters of the sign are listed just to the right of Saturn in the list. If Saturn is in Scorpio, then it says “Sco”. If it is in Aries, then it says “Ari”, and so on. You should now know what sign of the zodiac your Saturn is in, and how to identify the symbol that is associated with that sign. So let’s find out when Saturn will return to the sign it was in when you were born. In order to do this we have to look at an “ephemeris,” which is a book that contains a list of all of the locations of the planets on each day of a given year. 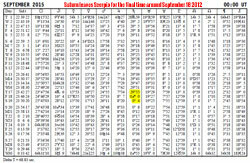 Luckily for us, www.astro.com also offers a free online ephemeris, which you can download in PDF format. What you should do first is look through the list of years towards the top of the page, find the year that you were born, and then open that file. Next, scroll through the PDF file and find the month and exact day that you were born. Find the column that lists the position of Saturn, and then check and make sure that it lists the same sign and degree as it did in your birth chart. The purpose of this step is mainly to become familiar with the symbol for the sign of the zodiac that your Saturn is in, and to see what that looks like in this particular ephemeris. The next step is to go back to the free ephemeris page, and now select a year about 27 or 28 years after the year you were born. Open that file, and then identify which sign Saturn is in in that year, and then go through each month and see if it moves back into your natal Saturn sign sometime during the course of that year. Basically what we are trying to do at this point is just determine when Saturn will first move back into the sign of the zodiac that it was in when you were born. When you finally find the date that Saturn moves back into the first degrees of the sign it was in when you were born, write that date down, as that is the beginning of your Saturn return. I recently compiled a list of dates for when the Saturn return starts and ends for different people depending on what sign it was in when they were born. You can use this as a sort of shortcut or cheat sheet if you have already figured out what sign Saturn was in when you were born, and you just want to know when your Saturn return will begin and end. Once you have determined when Saturn will return back to its natal sign, the next step is to determine when it will return back to the exact degree that it was in when you were born. Although the return of Saturn to the natal sign usually marks the beginning of the Saturn return, oftentimes some of the most pivotal events during the course of the two year Saturn return period take place around the time that Saturn returns back to the exact degree it was in at your birth. In order to do this you simply have to recall what degree Saturn was in in your birth chart, and then go through the ephemeris until you find the date when Saturn returns back to that exact degree. 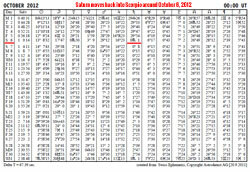 In our example chart Saturn was at 17 Scorpio, and according to the ephemeris Saturn gets back to 17 Scorpio for the first time around late November/early December of 2013. This is the exact Saturn return. There is a slight complication, though. Because of the phenomenon known as retrograde motion, for a few months during every year Saturn will actually stop moving forward through the degrees in each sign, and instead it will turn around and start moving backwards for a while, retracing its path. As a result of this, Saturn can actually move back and forth over the exact degree of the Saturn return up to three times before it finally moves on. So, for example, Saturn first makes it to 17 Scorpio in late November/early December 2013, and then it keeps moving forward, but then it retrogrades back to 17 Scorpio a few months later in June of 2014. 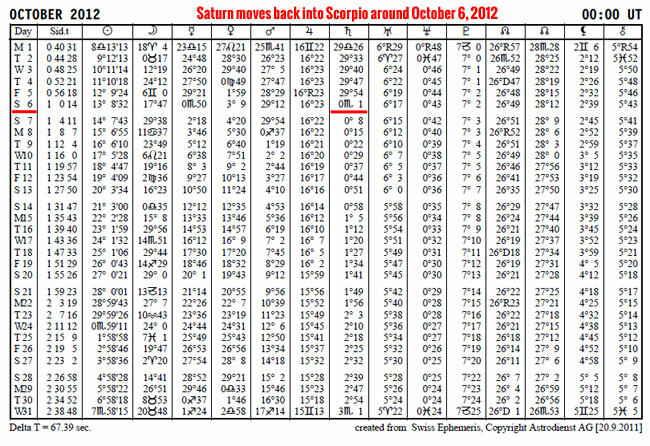 Eventually it starts moving forward again, at which point it moves over 17 Scorpio a third time in August of 2014. All three of these exact hits are extremely important, as they can be the focal points of the entire two year transit, so take note of when they will occur. 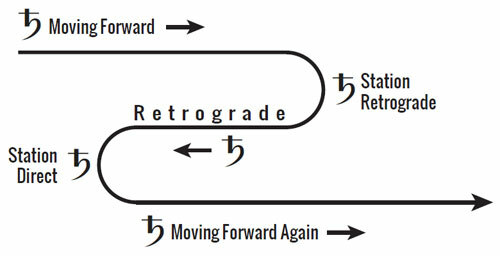 The following diagram illustrates what a Saturn retrograde period looks like from the perspective of its movement through one of the signs of the zodiac over the course of several months. In the diagram above imagine that the beginning of the sign is on the left and the end of the sign is on the right. If your natal Saturn was in the middle of the sign, then transiting Saturn would move over that exact degree three separate times due to the retrograde. The final step is to determine when your Saturn return will end, which basically just occurs once Saturn moves out of your natal Saturn sign. In order to figure this out you just need to look through the ephemeris, and watch as Saturn gets closer and closer to the end of the sign. Eventually you will see it get to 29 degrees of your natal Saturn sign, and then all of a sudden it will shift into zero degrees of the next sign. 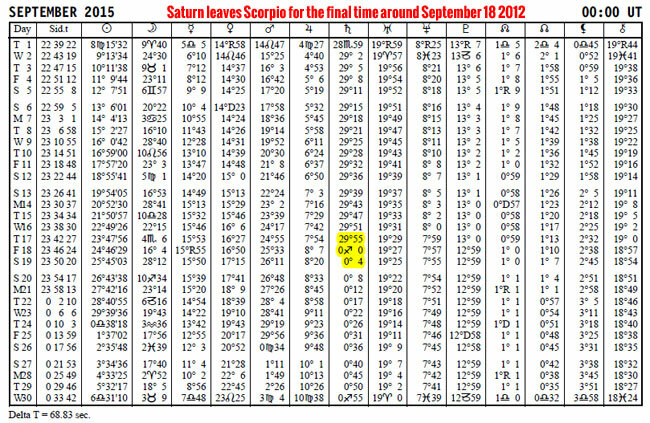 This departure of Saturn from your natal Saturn sign generally marks the end of your Saturn return. There is a catch, though. Because of the phenomenon of retrograde motion mentioned in the previous section, Saturn often doesn’t make a clean break when it moves into a new sign. Instead, it will move into a new sign for a few months, but then retrograde back into the previous sign a few months later. For example, Saturn leaves Scorpio and moves into Sagittarius for the first time in late December of 2014. But then a few months later it stations retrograde and then moves back into Scorpio in June of 2015. Eventually it starts moving direct again, and then it moves back into Sagittarius for the final time in September of 2015. It is this last departure from your natal Saturn sign that is the most important, because it marks the last time that Saturn will be in the sign it was in when you were born for another two and a half decades. So the Saturn return officially ends when transiting Saturn moves out of your natal Saturn sign for the last time during that time period, and isn’t going to retrograde back into that sign again anytime soon. Once you have found this date, you have determined when you will complete your Saturn return. That’s it for this guide on how to calculate your Saturn return. You now know how to determine exactly when your Saturn return will start, when it will peak, and then eventually when it will end. Now the only trick is to figure out how to successfully navigate your way through it. For that I would recommend reading through some of the other stories on this blog, and learning from the mistakes as well as the successes of others. For those of you who would like some help with calculating your Saturn return or interpreting what it means in your life, we are offering Saturn return astrology consultations over the phone or through Skype. Thank you – so kind to acknowledge that not everyone learns best by reading. Thanks! Most places where telling me where to find it but not how to understand it. You are very helpful. This was amazing. Thank you for taking the time to do this. Yeah, you can contact me (Chris) at astrologue@gmail.com, and you can contact Leisa at lschaim@gmail.com. It is always better to go with the more precisely calculated date rather than the general one that is supposed to be applicable to everyone. So does this mean that if you were born right at the start of saturn in scorpio, that your saturn return is going to be much much longer than someone who was born at the end? The duration would still be the same, but the most intense part would happen much earlier on rather than later. Ok cool, yeah that makes sense. Thanks for replying so fast Chris! 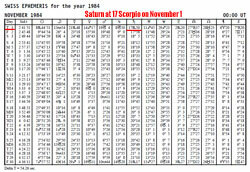 Another thing… my Saturn return is 16°22 in scorpio, but when I looked, 24th November 2013 is 16°19 and 25th is 16°26. Does this mean that it is just very fleeting at some point in between these two days? And is there any way of finding out what exact time it would be? I just checked in the software that I use, and it looks like Saturn gets back to 16°22 Scorpio at about 4:11 AM Mountain Time on November 24. This is around the point where your Saturn return will go exact, although for all intents and purposes the Saturn return is pretty much exact for as long as it is in the same degree as when you were born, so it is really the entirety of that last week or two of November. 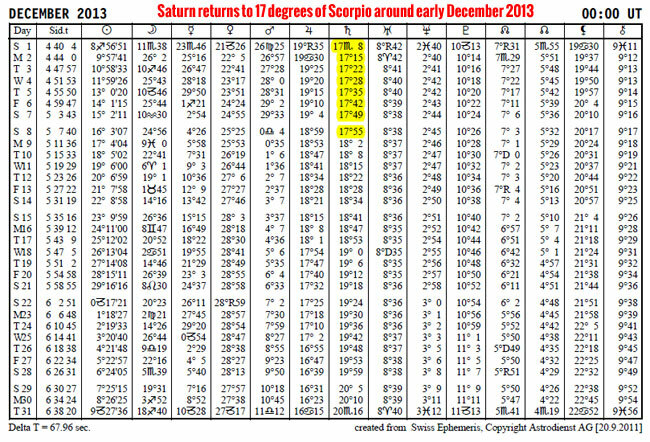 Also, note that Saturn will retrograde back to 16 Scorpio by July of 2014. It looks like it doesn’t quite make it back as far as 16°22, but it does get to about 16°38, which is close enough to basically mean that you will have a second almost exact pass next summer. Thank you for the info! Very straight forward and easy to decipher. I am curious though, should I count the exact time/degree on Astrodienst or rather the Ephemeris? The Ephimeris for my birthday shows the degree at 22*24 (since it doesn’t do time specific), but Astrodienst has it at 22 degrees 25’29”. So, wouldn’t that make the time I was born more likely 22*25 or 22*26, so perhaps later in the evening it would reach the exact point? I know the EXACT doesn’t matter too much, but since my Saturn Return is primarily next year I would like to track those days (for research/curiosity sake). Thank you! You would go with the exact degree that Astrodienst lists on your birth chart, assuming that you gave them your exact birth time in order to calculate it. That will give you the exact location of your natal Saturn. The degree in the ephemeris will only be approximate, based on where it was at the beginning of the day you were born. Hi! Thank you so much for the information, it has been exponentially useful in calculating my staurn returns. I have been feeling it intensely the last 2 years. According to Astro.com my Saturn returns @ 14Sco 7’17″r. I’m trying to configure when it exits my chart so I have something to look forward to. Since your exemplar is similar to my chart, is it safe to assume Saturn exits in 2015? Thanks so much! That is correct that it won’t be completely over for you until Saturn leaves Scorpio in 2015, although you are actually in the most pivotal and important part of the return right now, since transiting Saturn in the sky today is at 13 Scorpio, so you are about to have the exact return within the next week or two. A good way to imagine it is like a graph that starts at zero when Saturn enters the sign and then gradually builds up to the highest point at the exact return. After the exact return it gradually declines after that until Saturn leaves the sign. That is one way of conceptualizing the relative importance of the exact return versus the rest of the period in which transiting Saturn is in your natal Saturn sign. Thank you so much! Hopefully I’ve learned the lessons needed during this transit. And it definitely explains the intensity of the last few weeks. Thank you for sharing this and for making the video. I’m an auditory learner and I was born July 25th 1985 so I also have my Saturn in Scorpio. I had SUCH a rough year from 27 to 28 and so far 28 has been good..I was hoping I’d already gone through it but I wont have my exact Saturn return until Jan 9th 2014. Sigh. Hi thanks for this great post. 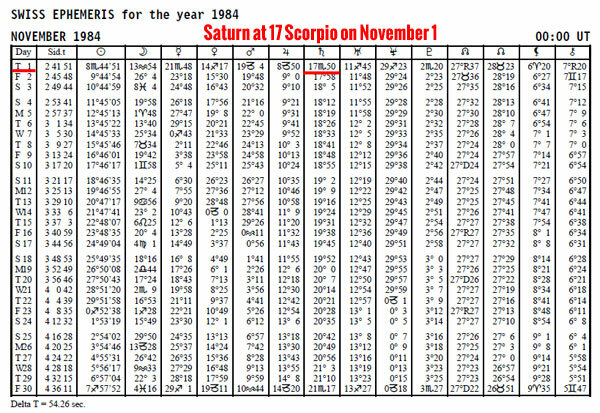 I just looked mine up(oct 4th 1983 12:18pm Willingboro NJ) I started going back in the EPHEMERIS and see that Saturn moved into Scorpio in 2007. Would that mark the begining of my return even though I was only 24 years old at the time? I think you’re confusing the symbol for Virgo with the symbol for Scorpio. It is easy to do, since they look very similar. Both look like an M with a tail, but with Scorpio the tail points away from the M, and in Virgo the tail points inwards towards the M.
Thanks so much for this detailed article! My birthday is November 22 (so right on the Scorpio/Sag cusp… I am definitely more of a Scorpio though :p), and 2013 was an extremely difficult year not just for me, but all the other Scorpios I know as well. If you just turned 27 and you were born on November 22nd, then your Saturn is actually in Sagittarius, so your official Saturn return will start next December. The Sun can only be in one sign, but whether it was in Scorpio or Sag for you will depend on your exact time of birth since it switched that day. What you’ve probably been feeling, though, is that you have several other planets in Scorpio, and so all of those have been getting Saturn transits. In addition to that, it’s pretty common for people to start feeling anticipatory feelings the year leading up to the actual Saturn return. Having planets in the sign before your Saturn can kind of make it feel like a longer Saturn return, but it can also be positive because it gets you thinking in the manner that the Saturn return requires before it actually starts. Hi, I am a bit confused. I never got into Astrology, but I have been having by far the worst year ever, and feel like my “trial” started. So when Saturn returns, is that my trial? or is that when it ends? Could someone tell me what I am doing wrong just to reassure myself? I was born Aug 15th 1986, not sure what time. I guess my research from various websites are confusing me and I am getting dif results. From dif sources, I found that I am going through my Saturns Return, which would explain a LONG series of life changing, unfair events, but research from other sites, or calculators I am also showing next year? Could someone kindly tell me how this works? It seems that I am experiencing Saturns Return, and will continue this until I am 28? So confused. Perhaps I read too much? I’m sorry to hear that you’ve been having a difficult year. You will start your Saturn return next December, as you have Saturn in Sagittarius. So the kinds of themes that this blog describes will primarily pertain to your life from later this year through 2017, though sometimes people feel some similar feelings in the year leading up to it. There can be other astrological reasons that correlate with having a hard time and life changes, though. An astrological consultation with a professional could explain some of those, but you would need your full birth chart, which would require finding out your exact birth time. If you should want to explore further and are in the U.S., most birth certificates should have a birth time recorded if you request a copy of the full, detailed certificate. I was born on April 17, 1987 at 11:55am. My Saturn is in 20 degrees Sag according to the natal chart, meaning that I will not begin my Saturn return until December 21, 2016. At that time, I will be 29, nearing my 30th birthday. Is this correct? I’ll be 27 this April and every single aspect of my life seems to be throwing me into a Saturn return right now. I thought it started at 27 or so and felt my life is just preparing me right now. Finding out that it will not begin until the end of 2016 is rather daunting! Hi Sara, I noticed that your numbers suggest you just ended an epicycle and that could be a big reason for feeling like things are so tumultuous at this time. 2013 would have been a 9 year for you, one of endings, letting go, loss, and a high degree of change. Fortunately, while some wounds may still be fresh this year, you can bet that if you’ve cleared a lot off of your plate you’ll now have room for new and (hopefully) wonderful things! 2014 is a new beginning for you, so plant seeds, make plans, and set goals/intentions for the next 9 years. You have a One Life Path so your Numerological “coming of age” (much like Saturn’s Return, but rather a Pinnacle shift) will occur when you are about 35 years old. Hope that helps shed some light! Thank you both so much. Yes, there has been a lot of loss and letting go and huge changes, but opportunities to plant seeds are emerging and. I am hanging on to those possibilities and intentions as I slowly move through this still-difficult period of loss and utter frustration. 🙂 I’ll research epicycle. Technically your Saturn return will begin later this year in December, which is the first time that Saturn moves back into Sagittarius. Sometimes the events and circumstances that characterize the Saturn return begin to develop as Saturn moves through the sign that immediately proceeds their natal Saturn sign. It is sort of like an anticipatory or preparatory pre-Saturn return period. This may be what is going on with you. Of course, sometimes there are other things happening in a person’s chart besides just Saturn, since there are several other planets that are just as important, so it doesn’t always have to be related to the Saturn return necessarily. It really depends on the way your chart is set up. Good luck. You were born with Saturn in Sagittarius, so you are in your Saturn return now – Saturn will be in Sag from December 2014 through December 2017, except for a few month dip back into Scorpio this summer. Hi Sheena, your natal Saturn is indeed around 9’45 Scorpio. So you’ve already had the three exact passes to your natal Saturn from transiting Saturn in 2013, but more generally, one’s Saturn return lasts from when transiting Saturn first enters the sign it was in when you were born until it leaves that sign, so for Saturn in Scorpio people that’s October 2012-September 2015.
very insightful site …. I was having a peculiar observation though. 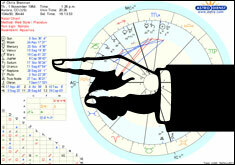 My DOB is 7-May-1972 07:30 AM and in my natal chart SAT phase satrts form 12/2009 after JUP. However, I’d a terrible time starting 06/2011 which continue till 12/2013. But 2010 was an excellent year. So, if I discount on 2010 & first half of 2011 – then I can take a 2.5 yr staring 06/2011-12/2013 [first 2.5 of 7 yrs of saturn] … does this explanation holds good/make sense at all. can you explain this ? Eek I’ve been hearing all about Saturn Return out of nowhere, so I checked (thanks to this site),and its approaching very fast! Glad to have a heads up! I do have a question about the Ephemeris though. 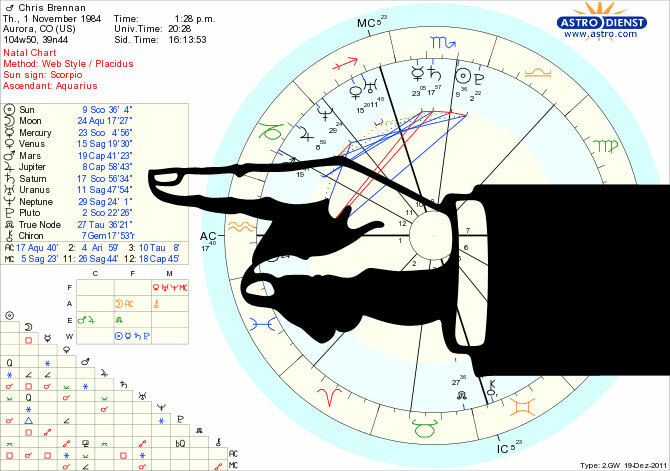 My natal charts always say I’m a Cancer Moon but the Ephemeries say Feb 19 1986 (was born 5:04pm Eastern in Oyster Bay NY) was a Gemini Moon.how do I figure out which is right? Dear Chris, it might be noted hat one of the simplest ways to compute the details of a Saturn return is using the free Transit Calendar an http://www.astro.com. It is found under extended chart selection -> special charts. For Saturn Return, the most convenient is ‘for three years’. One selects a start date the year before the expected Saturn return, e.g. for somebody born in 1950 like me one would select Jan 1978 to get the first, and Jan 2008 to get the second. The output is a PDF of several pages. There one looks for the bar labeled Saturn conj. Saturn (as glyphs). I am unable to upload screen shots here. It would make it simpler to explain. Sorry for the delayed response, but thanks for pointing this out Alois! I didn’t know about this feature, but this is very useful! I will make a separate blog post about it sometime soon with screenshots and instructions for people to follow in order to use it. Thank you for making these tools available! Thanks for such a detailed tutorial; this was super useful and I was able to accurately calculate my saturn return. My first saturn return is in sagittarius, specifically at 16°29’19” (the exact placement when I was born) which starts mid november 2016. However, saturn entered sagittarius last december 24th 2014 which coincided pretty exactly with the beginning of a really difficult time that is still going on. So my question: even though my exact saturn return isn’t for another year, is it possible that I am still able to experience saturn transitioning through sagittarius right now as part of my saturn return? Glad to hear you enjoyed the tutorial! Yes, our approach is that the Saturn return starts when transiting Saturn first goes into your natal Saturn sign, and ends when it leaves that sign for the last time, even if it is not near the exact degree return yet. That really does seem to match up with what people experience, though it does generally feel more intensified when it’s close in degree. So yes, the Saturn return started last December for anyone who has Saturn in Sagittarius. You have Saturn in Sagittarius, so the general period for your Saturn return lasts from Dec 2014 through Dec 2017. I’m sorry you’re going through hard times, and I hope that some of the information on this site can help you put it into more understandable context. Hello! My birth chart and ephemeris charts aren’t matching up. Saturn in 3’49r in one and 1’6 in another for May 25, 1988. Can anybody help me out here? Hi Melissa, your natal Saturn in your birth chart should be at approximately 1’02 Capricorn – the exact minutes will differ based on exactly what time you were born, but it will be around one degree of Capricorn. Hope that helps! Hi Anthony, yes, your natal Saturn is around one and a half degrees of Sagittarius, so you are in your Saturn return now since transiting Saturn already went into Sagittarius once, and you will get the exact degree return again pretty soon. Hope that is helpful! Thank you Leisa & Chris. This is amazing info! I am finishing my Second Saturn retun on Thursday and I am grateful for the lessons (very challenging and scary) but I made it. If you decide to write more on Saturn returns for a book or a blog I will be happy to share my experiences privately with you, as I do not want to frighten anyone …but if you know how to prepare, perhaps if I had known how to prepare, it could possibly help. Thank you for this amazing website, which helps me to know about saturn return event and prepare myself knowing the road ahead will be long and difficult. My saturn is at 7 degree Sagittarius so exact return of its is December and tomorrow is the start of my saturn return when saturn enters Sagittarius. And how curious I am, I quited the job I didn’t like last month (I had been reluctant before that but circumstance happened out of the blue pushing me to finally quit). Hours until saturn return and I feel lost, stressful while having lots of plans to realise. I am following the directions and found a discrepancy that I cant figure out or move beyond. I was born October 15th 1988 and the numbers given the astro reading and the ephemeris for my birth date do not match up! Can you help me figure why this is happening as I am trying to locate my Saturn return as I have just been asked to start studying underneath a shaman. Thank you for your help and much LOVE! Saturn was at 27 degrees of Sagittarius on the day you were born. Not sure why there was a discrepancy. A blog about what happens when Saturn returns to where it was in the sky when you were born, which occurs for the first time between the ages of 27-31. Copyright © 2019 Saturn Return Stories. All Rights Reserved.